This model has been tested as working on my test layout. Kadee Quality Products Co. Item is New-Sealed from Kadee ! Part Number - No 524. HO Scale - 1/87th Scale. Code 110 (.110") "standard" Smooth backed. 12 Sets Of Wheels. Truck Features. Kadee No 5 Coupler -The Universal Coupler! Kadee Quality Products Co. Centerset Coupler Shank. Couplers are New-Sealed from Kadee ! The NO.5® Coupler may be mounted with a #232 draft gear box or with Manufacturers cast-on coupler pockets. 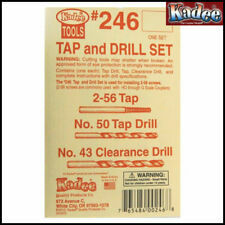 Kadee Quality Products Co. For Use With Kadee #2-56 Screws. New-Sealed from Kadee ! Tap & Drill Set. No 50 Tap Drill. #2-56 Tap. Not powered. Kit as new unmade. Box worn and label faded. Kit still sealed in plastic bag as supplied. Kadee Quality Products Co. Item is New-Sealed from Kadee ! Part Number - No 522. HO Scale - 1/87th Scale. Code 110 (.110") "standard" ribbed backed. 12 Sets Of Wheels. 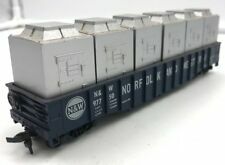 NMRA Standards-4.2 (Suitable for Wheel Code 88, 110, HO Scale 1:87). Scale:1:87,Suitable for HO scale. Material:copper and the surface is Ni plated. Rest of the world. Size: as the picture. LEGO DENMARK VINTAGE 1960'S FORD TAUNUS 17M DE LUXE HO VERY RARE ITEM MINT COND. Weight ca. 21 t max. tear-out force 118 kN (12 t) max. breakaway force 137 kN ( 14 t). 9.7x3.2x3.5 cm Scale: HO. Product Scale HO. View Our Categories. Speedi Loco Wheel/Driver Cleaner. Hon3 Through To O Scale. Kadee Quality Products Co. Kadee's driver cleaner is easy to use and efficient. New-Sealed from Kadee ! Part Number - No. 236. Zen Buddha Decoder 4 Function 3 amp w/Stay Alive. Big power needs bigger wire, so Buddha has convenient screw connectors, nicely arranged with all functions at one end, all power connections at the other… All connections are clearly labelled with “DCC Standards wire colour dots” too. The #58 Coupler may be mounted with the #232 draft gear box or with the Manufacturers cast-on coupler pockets. The coupler will couple and uncouple with other Kadee®HO and HOn3 couplers. Kadee Quality Products Co.
BACHMANN 46299 HO SCALE MOTORIZED TURNTABLE E-Z TRACK SYSTEM DCC READY LOCOMOTIVE NOT INCLUDED AS NEW. RED LEADS MISSING. Easy to cut with scissors or knife. Size 335 x 140 mm. View Our Categories. Bettendorf 50 ton Trucks. Kadee Quality Products Co. Item is New-Sealed from Kadee ! Highly Flexible sprung trucks. HO Scale - 1/87th Scale. 1 Pair Of Trucks. Part Number - No 500. KALMAR - CONTCHAMP DRD 450 - 70 C 5XS lifting capacity at the max. The new container stacker CONTCHAMP by KALMAR can handle containers and semi-trailers. Product Scale HO. View Our Categories. Jouef hj2308 ho/oo gauge steam locomotive 141 ta 476 sncf epoque 111 dcc with sound. tested and all was ok and the sound works perfectly. Kadee Quality Products Co. Item is New-Sealed from Kadee ! HO Scale - 1/87th Scale. Part Number - No 520. Code 110 (.110") "standard" ribbed backed. 12 Sets Of Wheels. A single insert to double the space in the wall cabinets from Kibri when you want to use N or Z scale models in the case. (matching display case numbers 12010/12012/12018/12020/12056). Product Scale. Kadee Quality Products Co. New-Sealed from Kadee ! Trip Pin Pliers. Adjust trip pins to the correct height by gently squeezing with these specially designed pliers. Curved jaw surfaces prevent kinking of the trip pins when bending or straightening. Kadee Quality Products Co. New-Sealed from Kadee ! Coupler & Special Purpose Tweezers. 1 Pair of tweezers. Part Number - No. 1020. The #146 Coupler may be mounted with supplied 242 draft gear box or with Manufacturers cast-on coupler pockets. Kadee Quality Products Co. Centerset Shank. Use the provided insulated draft gear box. A handy tool for assisting in the assembly of your Kadee® #4, NO.5®, 9, & 58 HO Couplers. 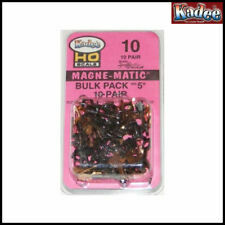 Kadee Quality Products Co. New-Sealed from Kadee ! Part Number - No. 701. Uncouple anywhere on your layout by DCC commands! The #156 Coupler may be mounted with the #242 draft gear box, other Kadee® HO-Scale draft gear box shown below or with the Manufacturers cast-on coupler pockets. The coupler will couple and uncouple with other Kadee® HO and HOn3 couplers. Manufacturer: Tsugawa Yokou. Wheel Polish Cleaner for HO scale motorized trains. This cleaner is for HO scale (above picture is from the N scale cleaner). HO Scale Wheel Polish Cleaner. Check our HO Scale Japanese TrainsHERE. Kadee No 452 Bachmann-Plus F7 Conversion Kit. Kadee Quality Products Co. Couplers are New-Sealed from Kadee ! Conversion Set For Bachmann Plus F7A & F7B Units. 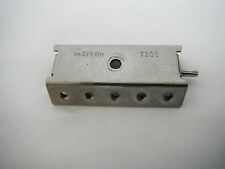 Conversion brackets for Bachmann Plus F-7 Unit locomotives. Part Number - No. 452. Fits NEM 362 Coupler Pocket. Kadee Quality Products Co. The Kadee ® Magne-Matic® coupler head with the swallow-tail shank to lock in the HO-scale NEM-362 draft gear pocket. Couplers are New-Sealed from Kadee ! Kadee Quality Products Co. Centerset Shank. The 20-Series Kadee® Magne-Matic® Couplers are designed for either Talgo (truck) or body mounting. Couplers are New-Sealed from Kadee ! The 20 Series Coupler easily installs in existing Talgo-mounted draft gear boxes with supplied #212 Talgo Truck Adaptors or can be body mounted with supplied #234 draft gear box (NO.5® Draft Gear Box) with side and center screw holes for mounting or with the supplied #213 Universal Adaptor Plate (20-Series draft gear box). Marklin model train operator. The truck and trailer are made by WIKING for Marklin. 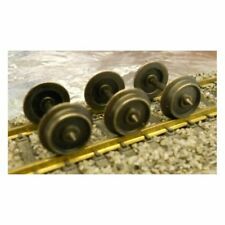 The wheels are Marklin and as such are not suitable for 2 rail operation. This set is great value for money whether you are a HO car collector, circus modeller or. Rietze Automodelle 1:87 HO Scale MAN Lions City Post Bus. Verbund Line. 72722. Rietze Automodelle 1:87 HO Scale MAN Lions City Post Bus. Verbund Line. 72722. Model is in excellent condition as can be seen in photos. Packaging is in great condition but may show some light wear due to age and storage. Please study pictures carefully as this is the exact model for sale. Please feel free to ask any questions or for more photos. Please see other items. Can combine postage on multiple items to UK buyers. Kadee Quality Products Co. Item is New-Sealed from Kadee ! Part Number - No 523. HO Scale - 1/87th Scale. Code 110 (.110") "standard" ribbed backed. 12 Sets Of Wheels. Truck Features. Kadee Quality Products Co. Couplers are New-Sealed from Kadee ! The #148 Coupler may be mounted in Manufacturers cast-on coupler pockets or any of our HO-Scale draft gear boxes (except #233 30-series gear box). LILIPUT L235012 OPEN GOODS WAGON OM21. DB N0.754 341 EPOCHE III BROWN LIVERY HO GAUGE. Rietze Automodelle 1:87 HO Scale MAN Dekon P Fire Decontamination Truck. 68042. IGRA Auto Model Railway Scale Tatra Lorry and Trailer. New In Box.